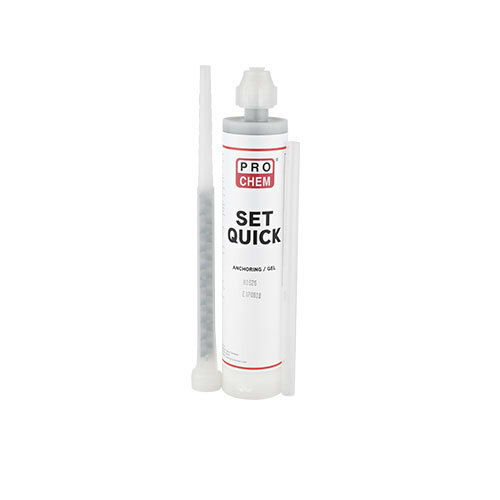 Set Quick | Pro Chem, Inc.
SET QUICK is two-component, moisture-tolerant, 100% solids, high-modulus epoxy gel adhesive that meets ASTM C-881 and AASHTO M-235. It is ideal for anchoring bolts, dowels and reinforcing steel in concrete. It is also ideal for vertical and horizontal structural bonding and patching. It may also be used to seal cracks and set injection ports prior to injection grouting. Surface Preparation: Surface to be bonded must be clean and sound. Remove dust, dirt, grease, laitance, curing compounds and other foreign matter by sandblasting, mechanical abrasion or hydro blasting. For drilled holes, clean with a nylon bristle brush. Remove all water and dust with clean, compressed air prior to installation. Air and surface temperature must be 40°F or above. Placement: For use as a structural adhesive, apply the material neat and work into the substrate. The glue line should not exceed 1/8”. When used as a chemical anchor, the annular space around the bolt in the hole should not exceed 1/8”. When dispensing the epoxy using the cartridges, first cut the static mixing nozzle mixer tip to the preferred opening for the job. Next, remove the “D” cartridge plugs from the extrusion throat end of the cartridge. Place the retaining nut over the small end of the static mixing tube. Securely hand tighten the retaining nut onto the cartridge making sure that there is no slack in the nut, otherwise leaking will occur. Place the assembled cartridge into either a manual or pneumatic gun. Pneumatic guns are recommended for large jobs where high production is required. Start installation by extruding material into a waste pail until a smooth uniform color without streaking has been achieved. Discard the first material that is extruded from the end of the nozzle until the uniform streak-free color is achieved. Off color or streaking will result in an off ratio mix, and SET QUICK will not set properly or develop maximum strength. Dispense the product using constant and even pressure. Start dispensing by placing the static mixing nozzle to the bottom of the hole pulling the mixing nozzle out slowly, filling the hole on the way out. Fill approximately ½ full. Place dowel, rod, rebar, pin, etc. into the back of the hole, rotating the rod slowly, and displacing epoxy as it is inserted. Whenever the dispensing is interrupted or otherwise stopped for more than 15 minutes, recheck the extruded SET QUICK for uniform streak-free color before use. Always establish uniform nonstreak color before use to verify proper mixing. To produce a mortar for interior patching repairs, mix 1 to 1-1/2 parts by volume of clean, dry, well-graded silica sand to one part by volume of mixed epoxy. Place the mortar, working it into the concrete substrate. Each mortar lift should not exceed 1 in. CLEAN UP: Tools and Equipment: Clean before the epoxy sets. Use a Pro Chem Citrus Cleaner.